Includes monitors and accessories to assess six machines or employees at the same time. 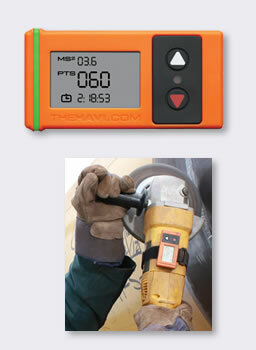 The HAVi monitors are intended for assessing Hand Arm Vibration exposure. The vibration magnitude for the tool is entered and then the HAVi measures the length of time that the worker is exposed to the vibration. From this it calculates the HSE points. Shows Magnitude/Time/HSE Points at real time on an integrated LCD Screen. 1000 hours trigger run time. Amber light flashes at EAV (Exposure Action Value) and Red light at ELV (Exposure Limit Value). The HAVi can be programmed easily in seconds without the use of computers or software, making it highly operative friendly. 100% waterproof and dust proof, it will survive the toughest of environments. No gluing or sticking required, fits any powered vibratory tool with simple ties or strap, both supplied, a true answer to all requirements. The HAVi can integrate into any current ‘traffic light’ system of HAVS compliance.